Local creative workshops in Whitby, North Yorkshire, throughout the year. Hosted at The Shepherd’s Purse, Whitby. Home of our much loved Christmas wreath making class. 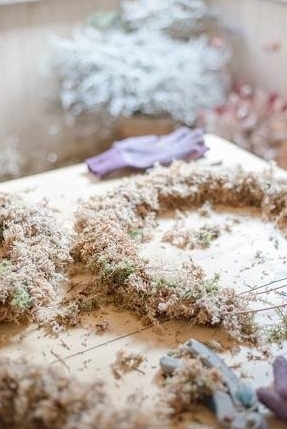 Create a Luxury Christmas Wreath to decorate your home. Learn the techniques to give you the confidence to go forward and decorate using your new found knowledge and skills. After you have finished your stunning luxury wreath I will show you how to use your offcuts with dried flowers and ribbons to create a beautiful modern wreath for inside your home. Leave with Luxury Wreath & Modern twig wreath. 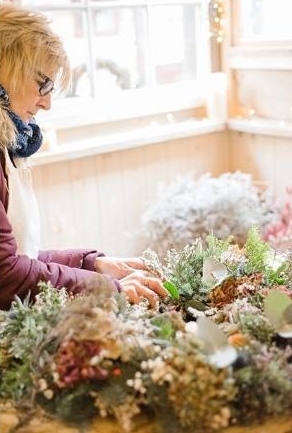 Join us for a celebration of Autumn and the upcoming Christmas holidays with a wreath making workshop at The Shepherd's Purse. 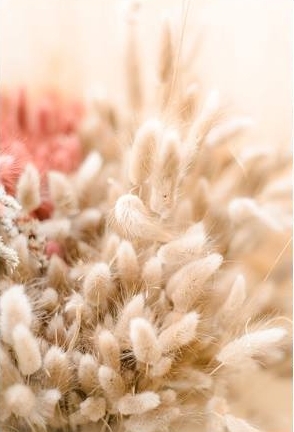 We will be using the traditional method of moss and wire, offering decorations from a gorgeous array of interesting foliage, seedheads, berries, dried and fresh flowers. the class will be taught using wild foliage, foraged branches, and seasonal blooms to create a lush and festive Christmas wreath that will dry nicely to last throughout the entire holiday season. The class fee includes all materials needed for this workshop and each student will build and take home their own finished design including flowers. Drinks and refreshments are included, if you have any requirements please let us know at the time of the booking. Refreshments change to compliment the workshop, delicious hot mulled wine at Christmas or fruity floral punch in the summer months. The Workshop will take place in our beautiful rustic workshop situated just off the cobbles of Church Street on the ancient East Side of Whitby. Close to shops, bars and restaurants, local attractions and car parks. Making our workshops the perfect girly day out with friends, quirky alternative hen party idea or birthday celebration. The Workshops lasts 2 1/2 hours. 6 persons per workshop. We can accommodate larger bookings on request. If you would like to stay over in our Guest House please feel free to book your stay via phone. 01947 820220. Parking is available in the local council car park on Church street, 2 minutes walk away from our Workshop. 24 hour tickets are available for £8. We are situated just behind Sanders Yard bistro in a pretty courtyard. When you get to the old market place, Sanders Yard is opposite.